I was a little hesitant going into this book – it’s been a while since I read a screenplay – but I loved it! I’m really glad I read it before seeing the film, because I don’t know if I’d have felt the same way, but this was gorgeous. And not just in a literary sense, but a design sense too. Each page has some little detail, and the book is scattered with designs of magical beasts and little beautiful additions. As for the story, I loved it! I had to focus a little more than when I’m normally reading to be able to picture everything clearly, but to me this was a Harry Potter fans dream. 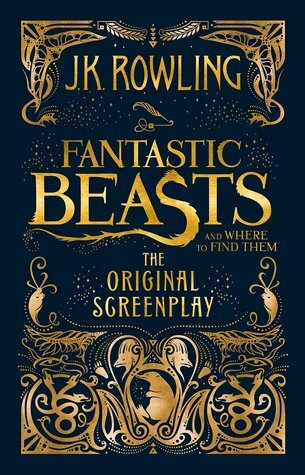 I loved the characters, especially Jacob and Queenie, and the beasts were so descriptive! It was so fun to read about Newt and his group chasing them all over the city. This screenplay was chaotic, and it was so entertaining to picture all of the scenes. So this might be more of a collectors item for most, but I adored reading it. It also contains one of my favourite quotes of all time which I included in this post! Onto Harry Potter and the Cursed Child while I’m still in my screenplay mode!